﻿ S&S Coach Company - Ohio. Find It Here. 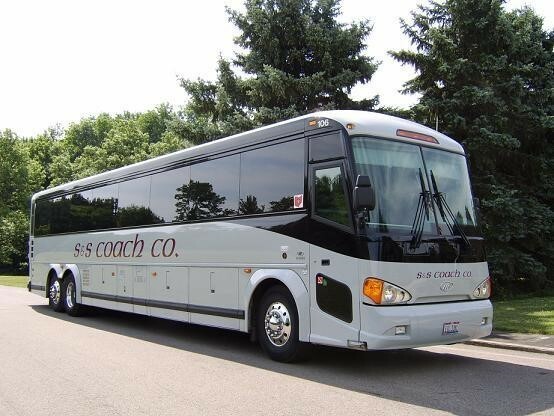 Group Transportation - Meetings and Conventions - Athletics - Parties and Reunions - Corporate, schools, colleges, sports teams, clubs, and churches - S&S Coach wants to make your bus trip a unique experience. Motorcoach trips can be more than getting from point A to point B safely. Motorcoach travel provides opportunity for co-workers to build a stronger team, for students to make life long friends and for families to make life long memories.For three generations, S&S Coach has been providing the finest in group transportation services. Be it across town for a meeting, a wedding, or a birthday party; across Ohio for a school field trip, a competition or a family reunion; or, across America or Canada for a cross-country tour, S&S Coach Company will provide you and your group the best in the bus industry.S&S Coach Company owns one of the newest bus fleets in the state. All coaches are lavatory equipped. Other passenger amenities on S&S's new coaches include plush seats with overhead reading lights, individual airflow controls, aircraft quality enclosed overhead storage for luggage, large under-floor luggage bays and a state-of-the-art entertainment system.